CHICAGO — Better than 79% of coin laundry store owners polled say that overall business was better for them in 2016 compared to the prior year, according to results from this quarter’s American Coin-Op Your Views survey. 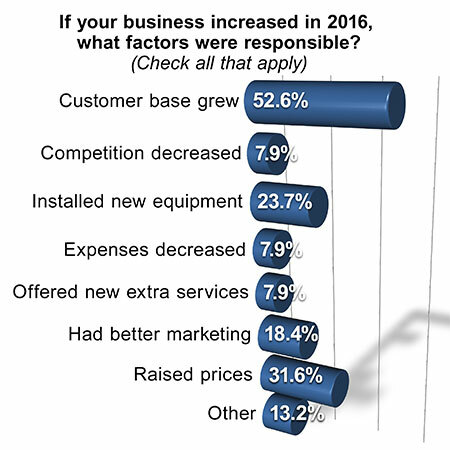 About 24% chalk up their improvement to “[installing] new equipment.” The boost was due to “better marketing,” say 18.4% of respondents. Equal shares (7.9%) point to decreasing expenses or offering new extra services. Roughly 13% gave “other” reasons as to why they believe business improved, such as expanding their footprint or adding consistent commercial business. 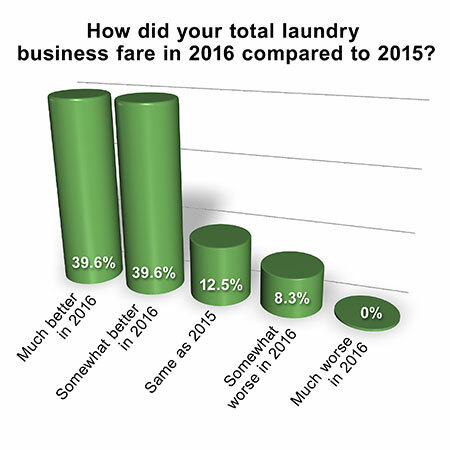 Among those whose coin laundry business worsened last year, equal shares (33.3%) blame it on their customer base shrinking, expenses rising, or “other” reasons. (Again, respondents could select any from among a list of six factors.) One-quarter of respondents blame competition cutting into their business, and 16.7% say customers cut down on the number of visits they made. A small share (8.3%) say their extra-service income dropped. For 2017, attracting new customers is the No. 1 business priority of 27.1% of store owners polled. Other respondents seek to “spruce up [their] store(s)” (20.8%), explore extra services or new sales opportunities (18.8%), add or update equipment (16.7%), increase vend prices and/or cut costs (14.6%), or “other” (2.1%).